Home > Explore > Draper Natural History Museum > F.A.Q. Our Draper Natural History Museum staff answers these frequently asked questions (F.A.Q.) about wolves, grizzly bears, Draper exhibits, global warming, and more. 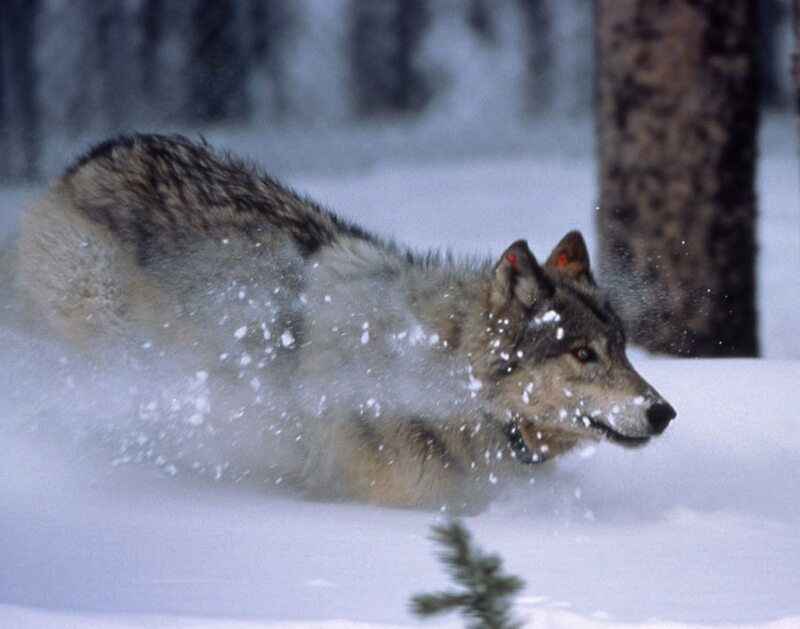 Q: How many wild wolves live in the Greater Yellowstone region, and what effect are they having on game populations? Yellowstone wolf, 1996. NPS photo by Barry O’Neill. A: There are currently about 500 wolves living in the Greater Yellowstone region. In the first few years after reintroduction, the wolf population grew rapidly. However, as the wolves reached carrying capacity of the environment, competition among wolves increased, and the population growth slowed considerably. In 1999, 2005, and 2008 the number of wolves declined, primarity due to disease (Parvo virus and Canine distemper). The population declined again in 2009, though this time the causes were low pup survival, the first documented case of starvation by an adult wolf, and wolves killing other wolves in territorial conflict. Yellowstone wolf biologist Doug Smith notes that after years of being culled by the wolves, there are fewer weak, vulnerable elk in the herd. Hunting has become more diffucult for wolves. Wolf impact on game populations varies from place to place due to habitat quality and other factors. The presence of wolves has altered elk behavior significantly–they are more vigilant and tend to linger less in areas where they are more vulnerable to predation. Together with an extended drought, human hunting, and other factors, wolves have reduced elk numbers in some areas. However, elk populations through most of the Greater Yellowstone remain well above game management objectives. Nonetheless, the number of human hunting licenses and length of hunting seasons are being reduced in some areas of the Greater Yellowstone region in part due to effects of wolf predation. Some evidence indicates that reduced elk numbers and changing elk foraging patterns has led to increased growth of willows and aspen trees in some areas, thus benefiting wildlife species that depend on these plant species. Scientists are currently exploring alternative explanations for increased willow and aspen growth. Q: Are the wolves introduced to Yellowstone in 1995-96 from Canada the same species of wolf that were driven to extinction in Yellowstone in the early 20th century? A: Yes, contrary to a popular misconception, the wolves native to Yellowstone and wolves reintroduced from Canada belong to the same species, Canis lupus. Q: What is climate change and what does it mean to Yellowstone? A: Climate change simply means that our world climate has shown a steady, long-term increase in temperature during the last 100 years, especially in the last few decades. The earth’s climate has fluctuated greatly during its long history, but the recent warming trend is especially dramatic. The majority of climate specialists agree that human activity, i.e., burning of fossil fuels, beginning with the industrial revolution has contributed to the current warming trend. It remains unclear, however, to what extent human activities are contributing to global warming and what other factors may be responsible. Climate change is dramatically affecting the earth’s poles, reducing ice fields and raising the level of ocean waters. The affects of climate change in the Yellowstone region are seen most clearly in alpine and subalpine sites, where glaciers are melting rapidly. There is some evidence that plants and animals adapted to alpine conditions are under stress or declining, and plants and animals adapted to lower elevations are shifting their distribution upward. 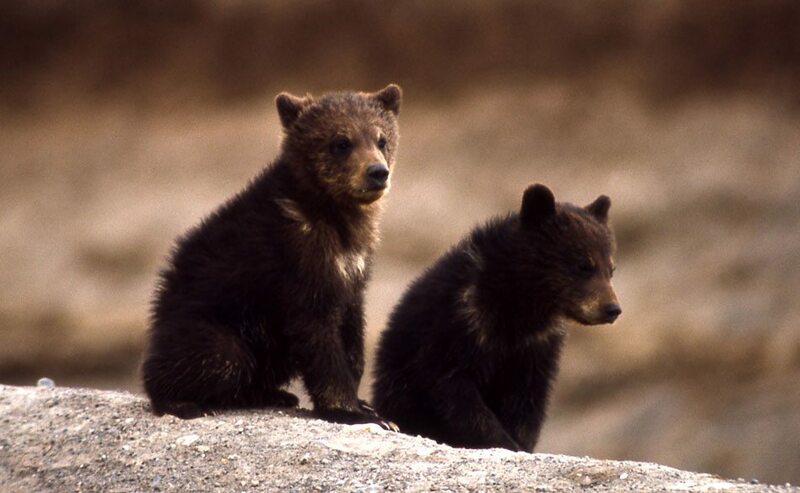 Q: How many grizzly bears live in the Greater Yellowstone region, and what are the biggest threats to the population? Grizzly bear cubs in Yellowstone, 1966. NPS photo. A: Nobody knows exactly how many grizzlies currently live in the Yellowstone region, but the best scientific estimates are around 700 bears. This is about three times the number of grizzly bears that occupied the region when the species was nearing extinction and received protections under the Endangered Species Act in 1975. The U. S. Fish and Wildlife Service has recently removed grizzly bears from ESA protection and grizzly bear management will be turned over to the states of Wyoming, Montana, and Idaho. The biggest ongoing threats to continued grizzly bear recovery include: sprawling human residential development, oil and gas extraction and development, the decline of important grizzly foods, such as whitebark pine (due to infection by an introduced fungus) and cutthroat trout (due to introduction of highly predacious lake trout to Yellowstone Lake), and a shortage of funding to adequately monitor and manage bears. Q: How were the hanging “scrims” seen throughout the Draper produced? Q: How was the laboratory table in Seasons of Discovery produced? 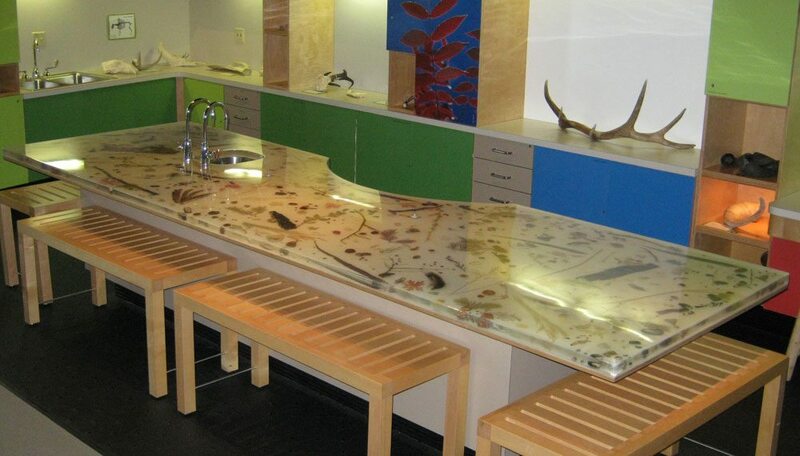 Nature table in Seasons of Discovery. A: Staff of the Center contributed natural materials acquired under permits from around the Yellowstone region. These were sent to Atta, Inc., 450 West 31st Street, New York, NY 10001, where they were imbedded in an acrylic matrix.